When I first review a game, I always check if it’s competent in its performance. Does it run well without crashing? Execute its mechanics and gameplay? Are there dips in framerate? If a game can pass these questions, I usually have a great time with it. Looking at FullBlast on the Switch, I think it’s a shoot-em-up title that’s technically sound. However, it’s an experience that is competent yet dull, and unfortunately can’t differentiate itself from its competition. 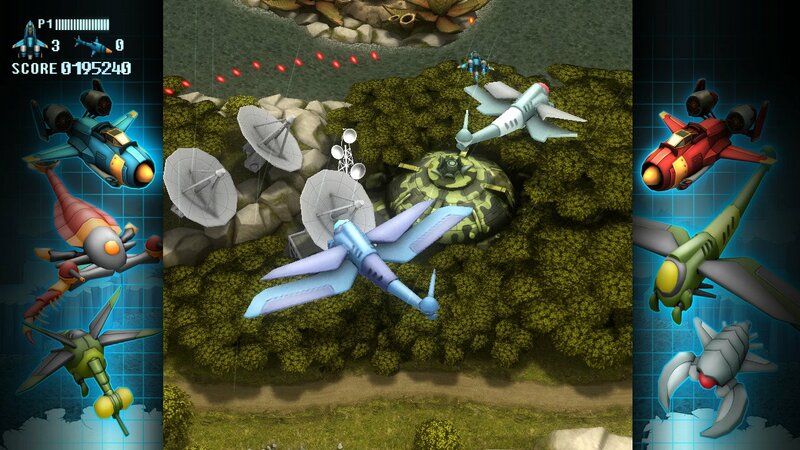 FullBlast puts you in the role of a pilot who’s fighting against hordes of aliens that want to destroy the earth. This being a vertical shoot-em-up game, it’s a five second plotline that’s existed as early as Space Invaders; however, using this narrative, you’re challenged in 12 stages of alien-busting goodness. (It’s more like three stages, but we’ll get to that later.) You also have some poorly translated conversations rife with grammatical errors and oddly worded text, but this works as a throwback to the cheesy text crawls of something like Zero Wing. As aforementioned, the game is a vertical shoot-em-up, and you’re free to move your aircraft anywhere on the screen as you dodge seemingly endless waves of alien creatures ready to pound your vehicle into spacedust. At the end of each stage, you’re treated to a boss battle where you’ll have to destroy a huge enemy before it kills you. While it’s a rather generic shoot-em-up for the most part, I did appreciate that this game had a health mechanic ala Sky Force Reloaded (basically a standard health bar compared to a one hit ship). You usually don’t die after one hit, so you can be a little more reckless with your navigation as you try and dodge the bullet spray from enemies. In addition to this, you can pick up powerups that can make your gun more effective, increase score or health, and even grab a side-weapon power bomb that can eradicate most enemies pretty quickly. You do have lives, though thanks to the level select feature, you can head back into the fray rather than starting back at the beginning (with the only penalty being that your score is reset, but this is one of those games that you can complete in one sitting). All in all, it has the gameplay fundamentals of a shoot-em-up. Unfortunately, while being a capable game, it’s unfortunately not enough to stand out in comparison to other eShop releases like Ikaruga or the aforementioned Sky Force Reloaded. You noticed that I didn’t use the term “bullet hell” until now (which is what I would normally use for games like these), but FullBlast is actually on the easy side of the shooter spectrum. Even on normal difficulty (the level that I usually play in this genre), I breezed through the main campaign with no trouble, sans the final boss fight. The bullet patterns aren’t that bad to avoid, and at times it feels like the spray feels empty rather than dense with bright balls of light. It’s rather easy to gain lives too, as they’re scattered randomly as you defeat aliens. Combine this with the health mechanic and the fact that upgraded weapons can get super powerful quickly, and the middle of the game was just a cakewalk. This might not be a problem with some genres, but the bullet hell subgenre is something that should be balls-to-the-wall difficult, and this isn’t it. In addition to the easier-than-average difficulty, the rest of the presentation is generic. The graphics look like something out of a last gen shoot-em-up, though they run at a very smooth framerate without many dips. The soundtrack is a rather trite background of heavy metal guitars meant to amp me up as I played through stages, but it was unremarkable and at the end of my time with the game, I didn’t really think any track stood out from the others. The 12 stages are actually just 3 different stages repeated four times each, and they look visually uninteresting as well. Considering I wasn’t dealing too much with enemy fire, it would’ve helped if the backgrounds or other visual design were pleasing to the eye. On the other hand, they’re not distracting as to get me out of the action, but they’re not memorable either. On a final note, there are basic leaderboards and a two-player mode, which will eke out some replay value for those that want more from this game or want to play with a friend; they don’t hurt, and function as you’d expect. I made it on the leaderboard, if that’s any consolation. FullBlast is a nifty little diversion for those that have a few bucks to spend on a shoot-em-up, but with lenient difficulty, generic presentation, and unremarkable gameplay, you might have a better time with another bullet hell game on the Switch eShop.